HHV-6 University : The article that made it clear the HIV/AIDS paradigm is a house of cards. The article that made it clear the HIV/AIDS paradigm is a house of cards. The best article about Chronic Fatigue Syndrome and the HHV-6 cover-up in the gay community may turn AIDS upside down. "Together Alone" by Michael Hobbes, published in Huffington Post (which just loves calling gays "queers") purports to be about the epidemic of gay loneliness. But the news it really breaks is that there is an epidemic of illness in the gay community that in most likelihood is related to the HHV-6 and AIDS/Chronic Fatigue Syndrome cover-up in the gay community. The passage that seems to bring the real epidemic of HHV-6, Chronic Fatigue Syndrome, non-HIV AIDS (or whatever you want to call it) is this one. Travis Salway, a researcher with the BC Centre for Disease Control in Vancouver, has spent the last five years trying to figure out why gay men keep killing themselves. We’re having lunch at a hole-in-the-wall noodle bar. It’s November, and he arrives wearing jeans, galoshes and a wedding ring. Salway grew up in Celina, Ohio, a rusting factory town of maybe 10,000 people, the kind of place, he says, where marriage competed with college for the 21-year-olds. He got bullied for being gay before he even knew he was. “I was effeminate and I was in choir,” he says. “That was enough.” So he got careful. He had a girlfriend through most of high school, and tried to avoid boys—both romantically and platonically—until he could get out of there. By the late 2000s, he was a social worker and epidemiologist and, like me, was struck by the growing distance between his straight and gay friends. He started to wonder if the story he had always heard about gay men and mental health was incomplete. And then he looked at the data. The problem wasn’t just suicide, it wasn’t just afflicting teenagers and it wasn’t just happening in areas stained by homophobia. He found that gay men everywhere, at every age, have higher rates of cardiovascular disease, cancer, incontinence, erectile dysfunction,⁠ allergies and asthma—you name it, we got it. Where is the Massive Gay Chronic Fatigue Syndrome Epidemic? While AIDS has dominated the medical news for the last two decades, another potentially major epidemic which the media has generally ignored or minimized, has grown exponentially. Originally mocked as "Yuppie Flu," the name "Chronic Fatigue Syndrome (CFS)" eventually evolved into what is now known as "Chronic Fatigue and Immune Dysfunction Sydrome (CFIDS)." The Centers for Disease Control and the National Institutes of Health (for very mysterious reasons) have been slow to respond to the potentially catastrophic epidemic of CFIDS which began to manifest itself at the same time as AIDS. Given that there have been many reports of CFIDS breaking out in families, schools, and communities, there is little doubt among serious observers that it is contagious. If this is so, why is it not spreading like wildfire in the gay community? What biological wall around the gay community has prevented CFIDS from being a major gay health problem? Neenyah Ostrom, who reported on CFIDS for a decade at "New York Native," has written three books giving a detailed history of the research on CFIDS. She has reported on a long list of symptoms and immune aberrations have been found in Chronic Fatigue Syndrome; virtually all of them can also be found in AIDS patients. These include problems with T-cells, natural killer cells, B-cells, and monocytes. There are serious neurological, digestive and cardiac symptoms that AIDS and CFIDS share. Where are all the gay men with the often serious CFIDS problems? Do they have some special immunological protection against CFIDS? Or is it that every gay person who has AIDS also has CFIDS? How does that work? How do doctors treat CFIDS in an AIDS patient? How come we never read anything about that? The medical literature is full of suggestions that, at the very least, CFIDS is AIDS-like. Some research suggests that an even stronger statement about its relationship to AIDS could be made. Nancy Klimas, one of the pioneering CFS researchers, led a team of scientists who concluded in 1990 that Chronic Fatigue Syndrome could be considered "a form of acquired immunodeficiency." Paul Cheney, one of the first medical doctors to look closely at the epidemic of CFS, has referred to it as "AIDS minor." Others have somewhat bizarrely called it an epidemic of something that could be called the "mirror-image of AIDS." Well, what about the gay community? Where is the epidemic of the "mirror image of AIDS" in the AIDS-besieged gay community? What is the difference between a gay person with AIDS and a gay person with "the mirror-image of AIDS." I bet that virtually no members of the gay community are aware that there could be thousands of members of their community with the contagious "mirror image of AIDS." Saying that CFIDS is not a fatal condition and doesn't deserve any serious attention is not really a fact-based statement. A number of people with CFIDS do seem to have died of complications of their conditions. A Massachusetts-based organization for CFIDS patients has a page of obituaries in every issue of their newsletter and many of the deceased people they report on seem to have died from problems related to their CFIDS. When was the last time you heard of a gay person dying of complications of CFIDS? And even though it may not always be fatal, many CFIDS patients describe their lives as living hells. Why do we not read a steady stream of stories in gay publications about gay people coping with CFIDS? Some estimates of the number of people suffering from CFIDS in the United States go as high as 14 million. If we use the 5% number which is often used to estimate the number of gay people in America, where are the 700,000 cases of CFIDS in the gay community? How about just 100,000? That should still be a noticeable blip on the medical radar screen. The gay community has been living under a medical microscope for two decades. If there is a major contagious epidemic that is AIDS-like, one would think that there would be all kinds of studies of this AIDS-like epidemic in the gay community. Some people seem to have made careers out of studying the illnesses of gay people. And yet one never hears of public health warnings about the transmission of CFIDS in the gay community. There are no gay CFIDS commissions, no gay CFIDS ribbons, no gay CFIDS subway posters, no GAY CFIDS benefits, no CFIDS quilts. If the worst estimate of CFIDS incidence is accurate, it would seem reasonable to suggest that for every gay AIDS patient a gay doctor has in his practice, he should have one or two--or more--gay CFIDS patients. And given the similarity of their symptoms, how does the doctor keep his patients straight? It is theoretically possible that a new AIDS patient will have more T-cells than an old CFIDS patient. If a gay person has the symptoms and immune abnormalities of CFIDS which look just like the symptoms and immune abnormalities of AIDS, and tests negative for HIV, is he given a clean bill of health? And why are gay doctors not warning the gay community about the possibility of contracting CFIDS and giving it to others? Gay people are issued every other imaginable kind of medical and lifestyle warning. Why none for CFIDS? Are we supposed to believe that the gay community is somehow miraculously immune to CFIDS? That would certainly be a fascinating finding. And perhaps a bogus one too. There is a far more parsimonious explanation for why we don't hear about a massive CFIDS epidemic in the gay community. Let's just say for now that it is very curious that most CFIDS patients tend to be neither gay nor Black while most AIDS patients tend to be gay or Black or both. Nothing political is going on here, right? Gay men are told that the key to protecting their immune system is knowing the HIV antibody status of their partners. But what if their partners have CFIDS? Why are gay men and lesbians not warned to ask about the CFIDS status of their partners, and not urged to inform their partners if they have any CFIDS symptoms? For that matter, given that CFIDS has been presented by research an an essentially heterosexual AIDS-like illness, why are heterosexuals not warned about transmitting or contracting CFIDS? Where are CFIDS warning posters in heterosexual bars? Needless to say, I think there is a Pandora's Box of a story here. It is one that could lead to a change in the way we look at AIDS and CFIDS. It might even lead to a major medical and scientific paradigm shift. But for the time being, can someone just answer this simple question: where is the major epidemic of Chronic Fatigue Syndrome in the gay community? 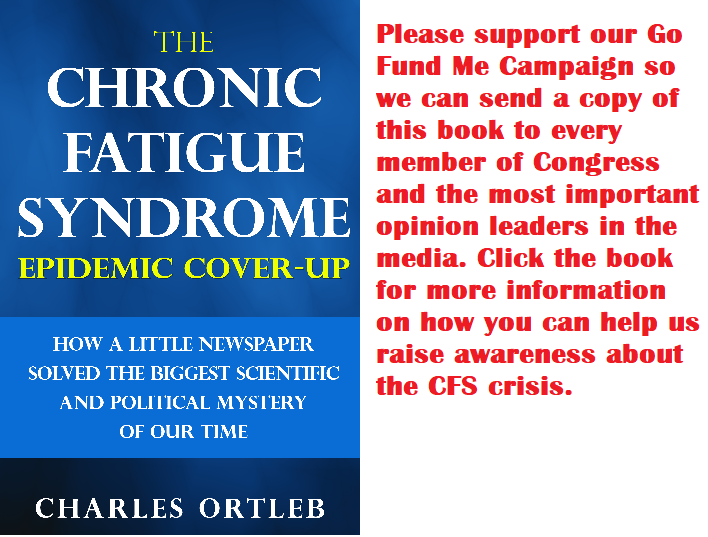 If you have Amazon Prime or Kindle Unlimited, you can immediately begin reading The Chronic Fatigue Syndrome Epidemic Cover-up and you will soon understand why the facts about the Chronic Fatigue Syndrome epidemic have been hidden from the public for almost four decades. If you want to know the truth about the Chronic Fatigue Syndrome epidemic, you need to discover the reporting of Neenyah Ostrom. For a decade, starting in 1988, Ostrom reported on Chronic Fatigue Syndrome for a newspaper called New York Native. What her reporting uncovered about the true nature of the Chronic Fatigue Syndrome epidemic will shock you. In The Chronic Fatigue Syndrome Epidemic Cover-up, Charles Ortleb recounts his newspaper's struggle to get the medical and political establishment to pay attention to Ostrom's pioneering investigative reporting on Chronic Fatigue Syndrome. 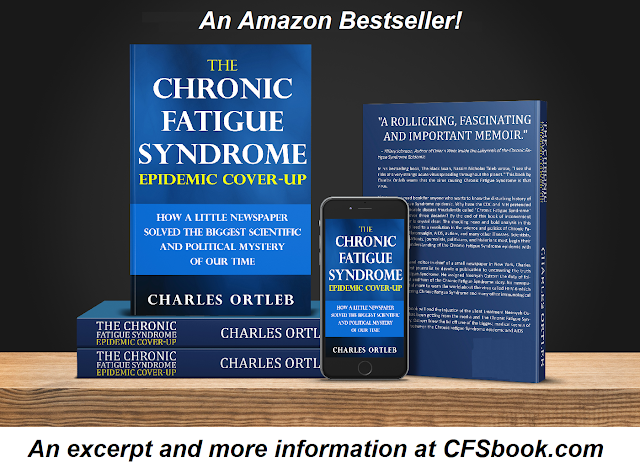 By the time you finish Ortleb's stunning memoir, you will understand why the Centers for Disease Control has been unwilling to tell the public the truth about Chronic Fatigue Syndrome. The CDC does not want the public to know that Chronic Fatigue Syndrome is a transmissible illness linked to a virus called HHV-6 that affects every system in the body. They have covered up the illness for so many decades that the neglected virus is totally out of control. Now it is causing a long list of other illnesses and many cancers. Nobody in the world covered the emergence of HHV-6 and its link to Chronic Fatigue Syndrome more than Neenyah Ostrom. Ostrom's decade of reporting on HHV-6 was recently vindicated by this statement from scientists at the University of Wurzburg: "While HHV-6 was long believed to have no negative impact on human health, scientists today increasingly suspect the virus of causing various diseases such as multiple sclerosis or chronic fatigue syndrome. Recent studies even suggest that HHV-6 might play a role in the pathogenesis of several diseases of the central nervous system such as schizophrenia, bipolar disorder, depression or Alzheimer's." The big question about Neenyah Ostrom and New York Native is this: How many lives would have been saved if the scientific establishment and the mainstream media had paid more attention to Neenyah Ostrom's reporting on HHV-6 and Chronic Fatigue Syndrome in New York Native? One day, if there is any justice in the world, the CDC and the medical establishment will apologize for not paying attention to Neenyah Ostrom's groundbreaking work on Chronic Fatigue Syndrome that Charles Ortleb published in New York Native. That would be a fitting end to one of journalism's greatest David and Goliath stories.